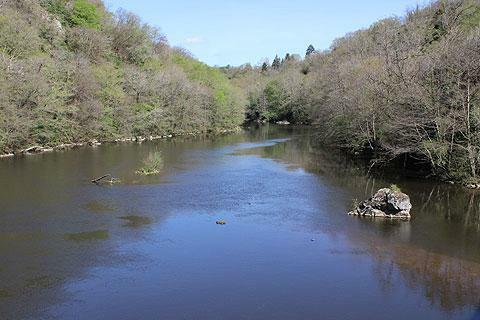 The Creuse river is very picturesque as it crosses the Indre department, and this is a very pleasant region to explore with an interesting mix of towns, villages and scenery to enjoy. The Creuse enters the department at Crozant on the southern border between the Indre and Creuse departments. It then flows towards the north as far as Saint-Gaultier before turning to the west to cross the Brenne region. 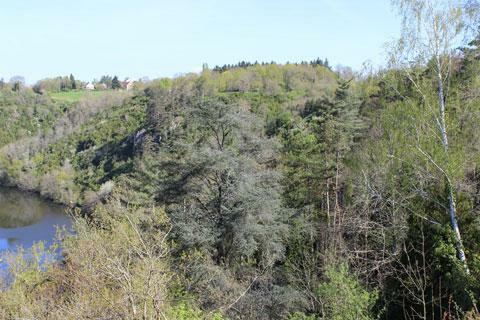 The Valley of the Creuse (Val de la Creuse) is the name usually given to this area of southern Indre. We found ourselves in this region almost by chance as we were crossing France, and until then we had never heard of the Creuse Valley or appreciated its natural beauty. We can now very much recommend it as a place to be visited! This is the very northern edge of the Massif Central region, where it meets the flat plains of central France that lie to the north. The landscape here in the southern Indre is very much like that found in the Dordogne or Correze departments further south, with forested hills, small fields and traditional farmhouses. Because the roads are quiet and the region is not part of the major tourist destinations in France it is also an excellent destination for cycling or hiking. 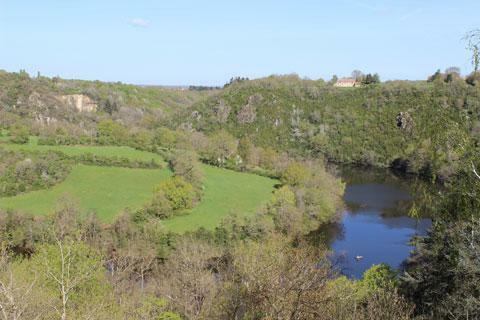 Crozant, a few kilometres south of the border and in the Creuse department, is well worth visiting to see the ruins of the castle and the lovely view across a loop in the river. For a closer view of the river go the little Pont Charraud bridge, an old stone bridge in a picturesque setting. Chambon and Eguzon Lake. The lake, which can be called either Eguzon Lake or Chambon Lake, was created by the construction of the dam at Eguzon. The resulting lake is the largest in the Indre department and also a very popular base for leisure activities including a beach, water-skiing, canoes and sailing, among others. Gargilesse-Dampierre, a very picturesque small village with a 12th century church containing ancient frescoes which is also known for being the village where George Sand lived and worked. 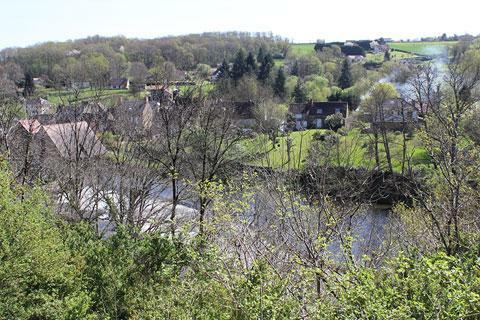 There are numerous ways to enjoy the valley on foot, from a stroll along the riverside in Argenton-sur-Creuse to a lengthy hike in the countryside. 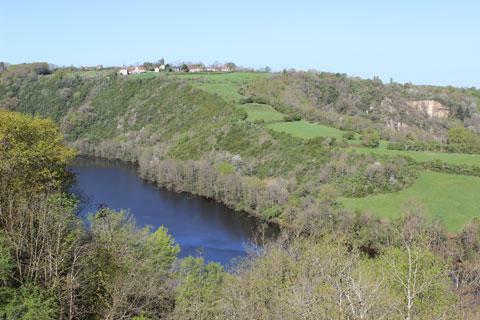 One option we recommend and a very nice way to discover the Creuse Valley is to follow one of the trails along the river valley and through the countryside starting at the Boucle de Pin just north of Gargilesse-Dampierre. From the viewpoint across the Boucle de Pin (on the road close to the north-east of the village of Le Pin) there are three different waymarked paths varying in length from four kilometres (about one hour) through Le Pin and along the river; or seven kilometres (two hours) along the river and through Badecon-le-Pin; or 16 kilometres (about four hours walk), a longer walk that also crosses a significant amount of countryside. 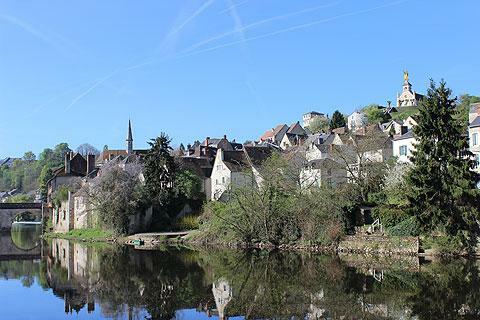 Argenton-sur-Creuse, a lively town which has a small historical centre with an ancient bridge across the river and several traditional mills and also a very picturesque town centre walk along the banks of the Creuse river. Saint-Gaultier also has a pretty section of river flowing through the town centre. If you want to continue to explore further downstream along the Creuse see our guide to Brenne Regional Natural Park.